These Bylaws were revised at a Congregational Meeting April 30, 2017. The cemetery of St. John Evangelical Lutheran Church of Golden Spike is not a public cemetery. It exists primarily to serve the needs of the active members of the congregation. All those on the active roll of member shall have free use of the cemetery. Children of active members under the age of 18 (even if inactive) shall have free use of the cemetery. Past or present pastors or interim pastors of this congregation, and their spouses, may have free use of the cemetery. 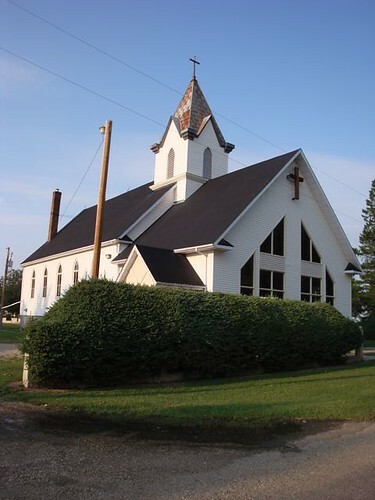 Those on the active roll of sister (ELCIC) Lutheran congregations, having been a past member of this congregation, or their children under the age of 18, shall have the privilege of using the cemetery and shall pay the current fee per burial ($2000) at the time of use and before burial. Those on the active roll of a sister (ELCIC) Lutheran congregation not having been past members of this congregation shall have the privilege of using the cemetery and shall pay the current fee ($3000) per burial at the time of use and before burial. Those not on the active roll of sister (ELCIC) Lutheran congregation, having lapsed membership of this congregation, shall pay the curant fee ($3000) per burial at the time of use and before burial. Non-Lutherans who have been attending worship services and/or communion in this congregation or who have assisted in the functioning of this congregation (e.g..spouse of a Lutheran member, or church advisor, or teacher etc.) may have the use of the cemetery for a fee determined by church council. Fees for each burial (casket or urn) follow the fees as stated above, e.g. four urns in one plot will pay the current fee for each urn. Non-Lutherans who do not qualify as outlined above may NOT use the cemetery. Discretionary Compassion Clause: In rare extenuating circumstances, council may consider granting cemetery privileges on compassionate grounds while adhering to the INTENT of the cemetery bylaws. Reservations for plots may not be made for specific grave sites except for the spouseAll burials must use concrete vaults, including urns. All caskets must be placed in concrete vaults. An approved marker, stone or monument must be placed at the head of each grave within 24 months, but always under the supervision of the Cemetery Records Committee. A $1500 refundable deposit for an approved marker must be paid by past members and non-members before burial. To continue the beautification of the cemetery and to avoid any damage to equipment or injury to maintenance volunteers, flowers and/or ornamentation (e.g. solar lights) are only allowed to remain on a plot providing they are attached to the headstone. Once flowers have withered, they will be removed as well as any attached wires and/or vases. NOTE: This is not the complete Cemetery Bylaws. Please contact the Cemetery Records Committee or Church Council for more detail.